The Stirling Engine is an External Combustion Engine (the heat source is outside the engine) and can use any available source of adequate heat or cold. It is a classic illustration of converting heat energy into mechanical work using a thermodynamic cycle similar to the well-known Carnot cycle. In this case, however, the engine needs two pistons, a small power piston and a larger "displacement piston" that also stores heat energy. 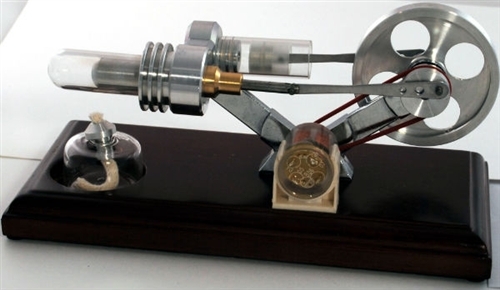 This Stirling engine is powered by an alcohol lamp and has a built-in dynamo that lets the Stirling engine power an LED bulb. This is an excellent demonstration of the conversion from heat to mechanical to electrical energy. All Stirling engines are tested before shipping. They must ship via Priority Mail from California.